They live in completely different worlds. Can love bring them together? 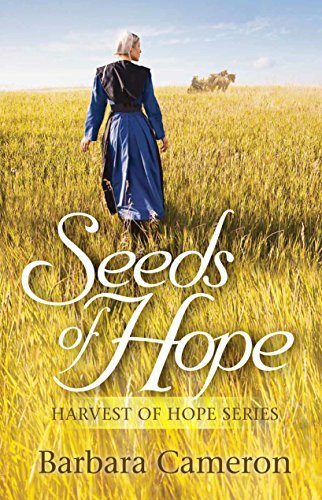 Such great descriptions had me caught up in both the modern world and the old world of the Amish when the two worlds are brought together again in Seeds of Hope. You have the fast paced world of Mark where so many only care about how everything affects them and then Miriam's slower paced world of making sure everyone is loved and taken care of. There were some great characters that come in and out in this book and that kept me turning the pages. Grandpa in the end though just shined through for me. Now don't get me wrong, I certainly felt sorry for the trails and hardships that Mark and Miriam were going through in their lives, but Grandpa stayed on top of my list. It was funny how I couldn't wait to get to a part where he was back in the story. I was always wanting to make sure someone gave him dinner and checked on him. His character was just lovable and people really listened to what he had to say. He knew just how to make people think about what was most important in their lives. He also seemed to have everyone a little wrapped around his fingers! Loved that. This book reminds me although hardships and trails happen in every one's life, in the end they can turn into something good. Barbara Cameron leaves us with a ending that doesn't disappoint making Seeds of Hope a great read!